GUYMON, Okla. – Each spring, hundreds of cowboys and cowgirls make plans to be in the Oklahoma Panhandle for the annual Guymon Pioneer Days Rodeo. 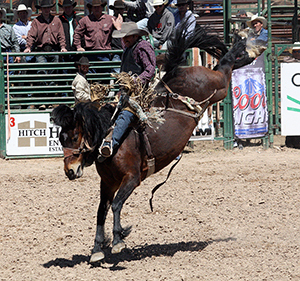 Muncy is one of 942 contestants who have entered this year’s rodeo, with four performances set for 7:30 p.m. Friday, May 2; 2 and 7:30 p.m. Saturday, May 3; and 2 p.m. Sunday, May 4, at Henry C. Hitch Pioneer Arena. In 2013, there were 611 events in the Professional Rodeo Cowboys Association. Of those, few see contestant numbers like Guymon. To accommodate the large number of players, the competition takes place over seven days, with “slack” beginning at 8 a.m. Monday-Friday. Steer ropers will compete in four go-rounds on Monday, April 28, and Tuesday, April 29. Tie-down ropers, steer wrestlers and team ropers will take part in two rounds Wednesday, April 30, and Thursday, May 1. Barrel racers will compete Friday, May 2. “It’s a big rodeo for us, and that’s a good time of year for us to all get there,” said Muncy, who was a member of the Oklahoma Panhandle State University rodeo team when he won the collegiate bronc riding title in 2007. “Guymon is really special to me. I went to school there, and I have a lot of great friends there. Muncy had a magical 2007 season. That May, he shared the bronc riding title in Guymon with legendary Canadian cowboy Rod Hay. A month later, he claimed the National Intercollegiate Rodeo Association title, then backed it all up with the PRCA world championship in December. He added a second gold buckle in 2011. His younger sister, Jordan, also competed on the Panhandle State rodeo team and earned the college championships in breakaway roping and the all-around in 2010. Texas County is special to the Muncy clan. There are a number of reasons why Pioneer Days is an attractive stop for ProRodeo’s brightest stars. It’s the largest rodeo in the country next week, and it offers a true home-away-from-home feel. Contestants are guaranteed great hospitality, and there are many of the top cowboys in the game who will make Guymon their home for all seven days. “We try to do everything we can to get the contestants here every year,” said Earl Helm, chairman of the volunteer committee that produces the annual rodeo. “To have that many contestants coming to town, spending money in our restaurants, hotels, convenience stores … it’s very important to our community. That’s why we pride ourselves in making this a cowboy’s rodeo. Of course, a big part of that is the opportunity to compete on quality livestock. Members of the committee work hard to have the right timed-event cattle in place to give every cowboy and even shot at his share of the large purse. In addition, Pete Carr Pro Rodeo not only will bring its top animal athletes to town, but Carr will bring in other premier stock contractors to ensure that the top bucking horses and bulls in rodeo will be part of the action. That’s a major drawing card for the top roughstock cowboys, like Muncy. “When you get to Guymon, you know you’re going to have great bucking horses there,” he said.